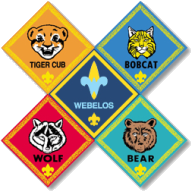 Our first pack-meeting for 2015-16 is scheduled for Saturday and as has been our custom for the September event, this will be a family-oriented welcome-back cookout to which friends and family are invited including friends of the scouts who may be interested in learning more about Cub Scouts. The main event of the evening will be an age-appropriate version of the "Tough Mudder" for adults. In addition, the pack meeting will be followed by a campout. Keep in mind all ranks requirements (expect Tigers) now require camping. The pack will hold campouts in September (tent camping), October (tent camping), and November (cabin camping). If you wish your son to received rank advancement at the Blue & Gold Dinner in February, please plan to attend one of these fall campouts. Thanks. We are looking forward to seeing everyone again for another great year.